A Viking sword from 9th or 10 century was discovered in a boat grave in Dysnes, North Iceland, a few days ago. The sword was in a bad shape and the archaeologists had to resort to unusual methods to retrieve it whole, as you can see in the video. “Yesterday morning we managed to lift up the sword with the help of a conservator. The sword is in such bad shape we had to lift it up in the soil. We dug around it, stuck a metal plate underneath, wrapped it in plastic, and then covered the whole thing with plaster. It was sent to the National Museum to be studied further,” says archaeologist Hildur Gestsdóttir of Iceland’s Institute of Archaeology. She is leading the excavation. The group hasn't started excavating, just removed the top layer of the earth and have already found more than they expected. 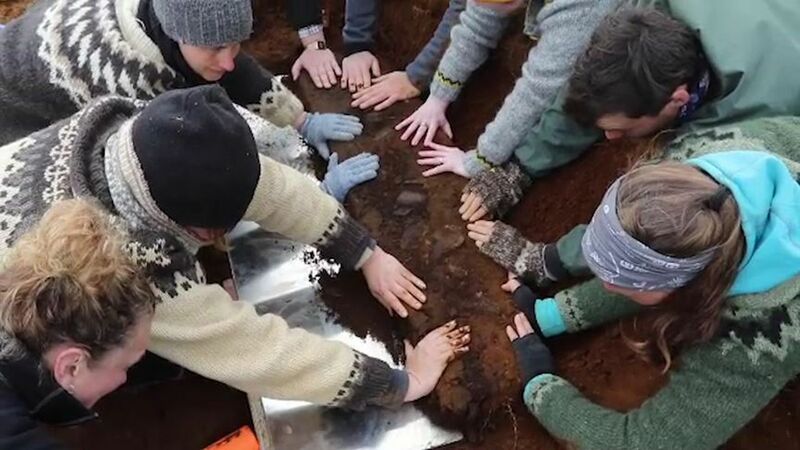 They have found two boat graves, which are not common in Iceland, along with two other graves. The sword was found in one of the boat graves.